Summer foliage is often a challenge, dealing with all those greens! 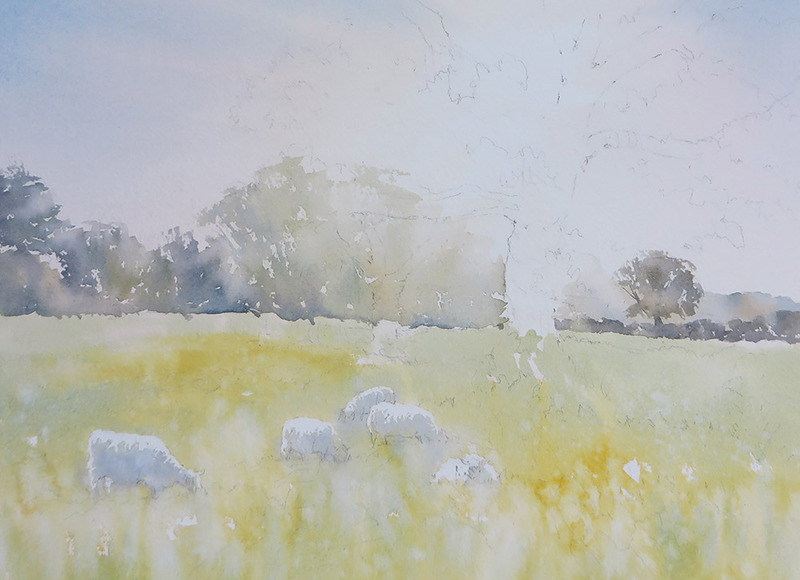 Looking into the sun helped me simplify this view of trees and grazing sheep, creating atmosphere while reducing shapes and details to receding silhouettes. 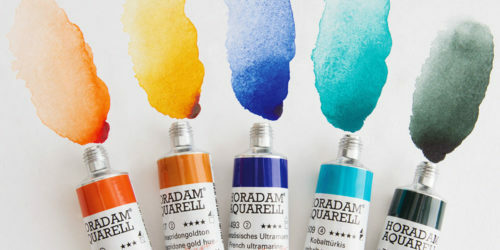 Raw Sienna, Burnt Sienna, Cadmium Yellow, Light Red, Permanent Rose, Alizarin Crimson, Cerulean Blue, Viridian Hue. 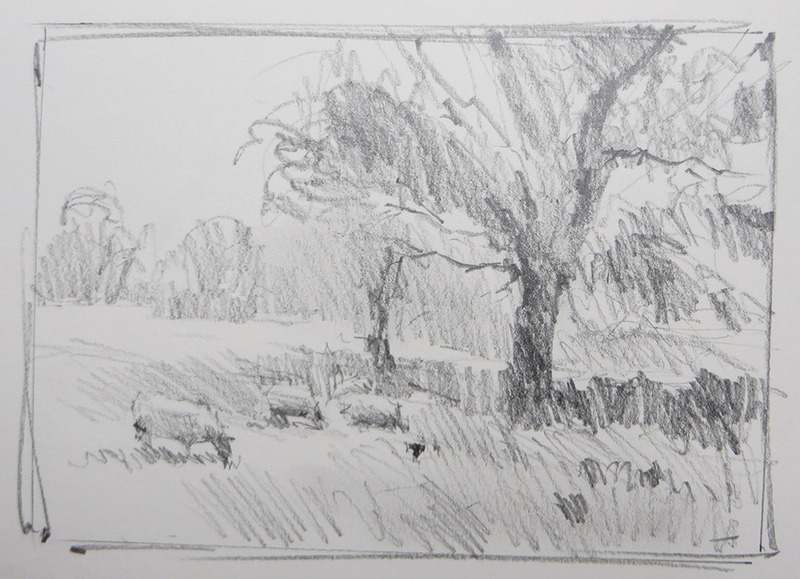 I began with a tonal sketch to plan my composition, placing the main tree on the right third and grouping the sheep to lead the eye into the scene. 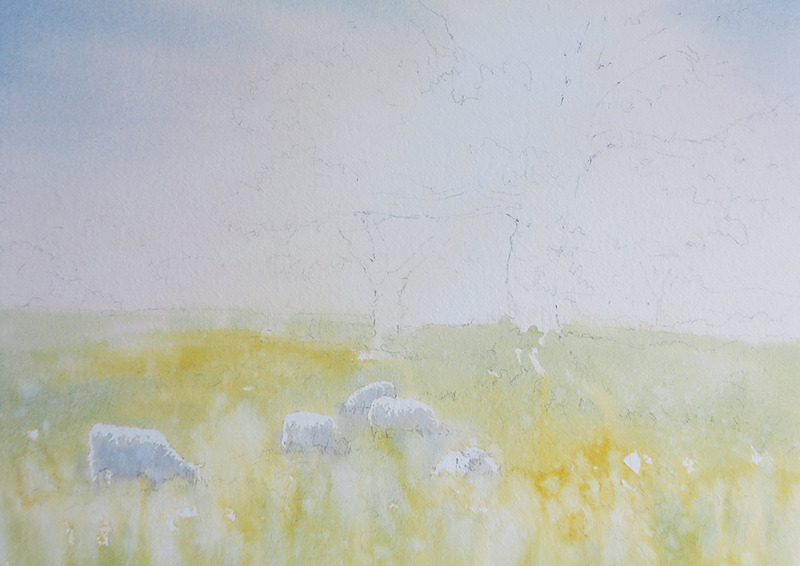 I then sketched the composition onto the watercolour paper, masking the highlights on the sheep with masking fluid. Wetting the entire sheet first, a pale wash of Raw Sienna was applied to the sky where the sun was coming from, adding a touch of Permanent Rose on the left and then Cerulean Blue. I continued with the field and a pale wash of Cadmium Yellow, adding touches of Cerulean to create a pale green in patches. Droplets of water were flicked over the grass as it dried to create dappled textures. 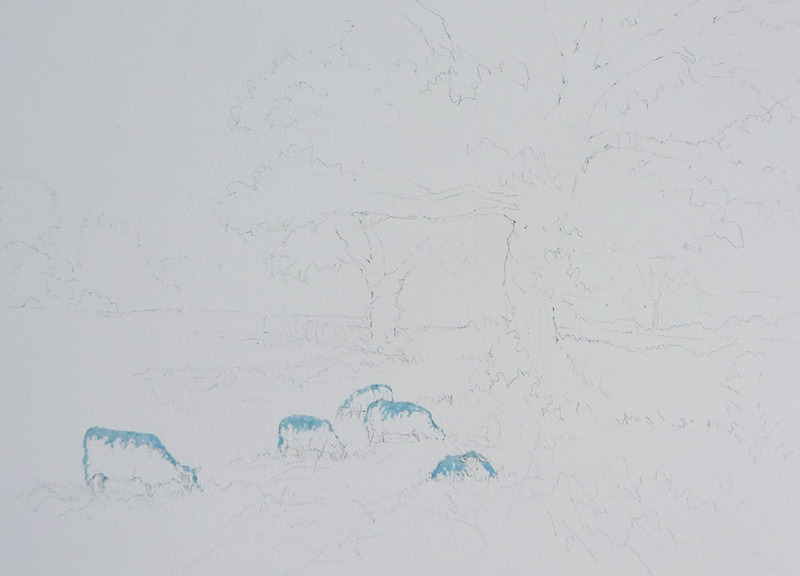 The sheep were tinted with a light grey, mixed with Cobalt Blue and Light Red. When all was dry, I removed the masking fluid. Next came the distant trees, keeping everything pale to help it recede. I used Viridian and Alizarin Crimson to make a grey green, adding touches of Raw Sienna for the trees on the right. Dry brush work helped to suggest the texture of the foliage. When the distance was dry, I developed the middle distance and foreground foliage. Working quickly and with a large pointed brush, I developed the main masses with Cadmium Yellow and Cerulean. While still wet, I added the darker areas with a stronger mix of Cadmium Yellow, French Ultramarine and a little Burnt Sienna, lifting out the sunbeams with a dampened brush. I now add the branches using Burnt Sienna and French Ultramarine, dampening the foliage where the sun shines through to keep things soft. The trunk is added with the same mix, continuing with the hedge with a dark wash of greens, blues and browns. 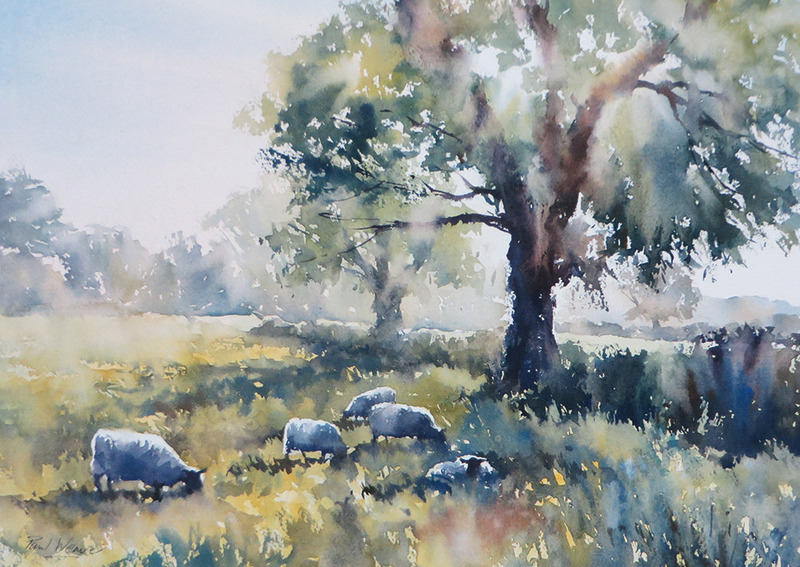 The shadows on the sheep were darkened with Cobalt Blue and Light Red. 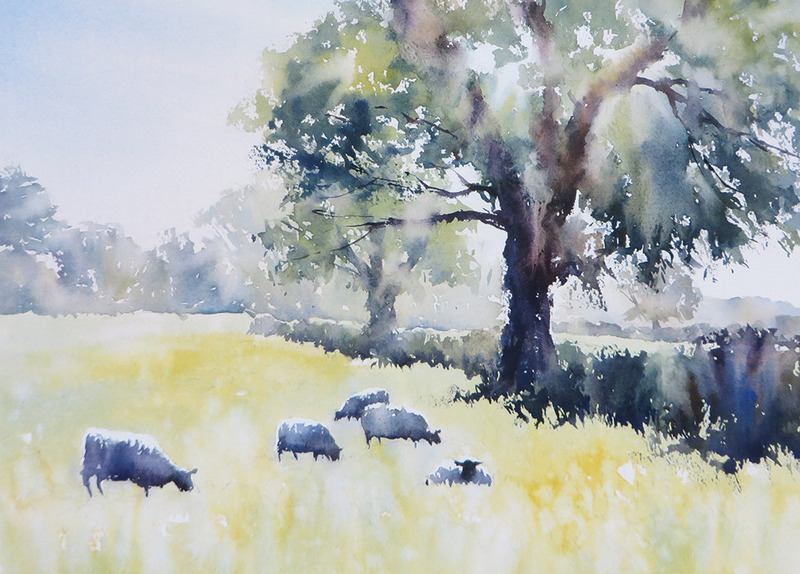 Finally I developed the shadows falling across the grass, using various mixes of the greens used in the foliage. 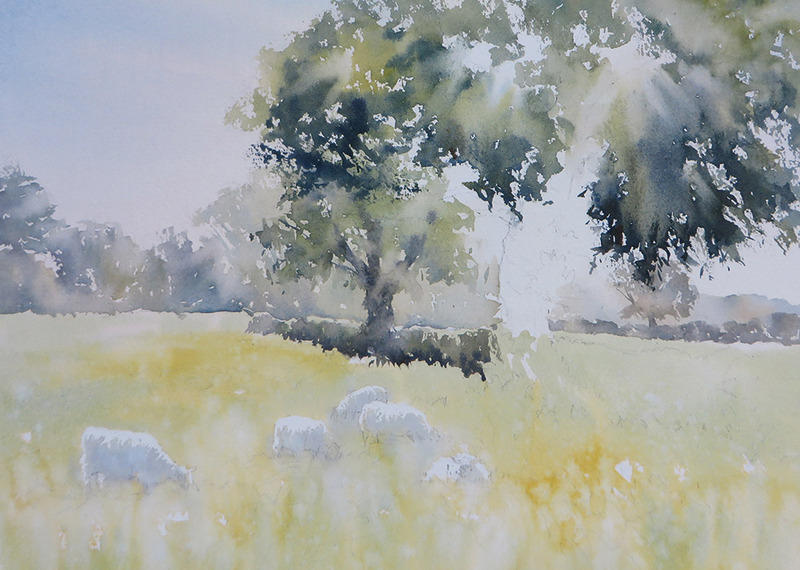 The shadows are important as they help define the bright highlights on the sheep. 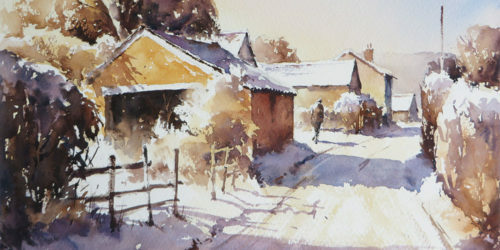 I combined dry brush work and wet in wet to create textures and soft edges. Am enjoying using your tutorials, so plesae keep them coming. I agree with Colin, more boats and rivers etc please.